Film premieres always look so glamorous – the lights, the red carpet, being hounded by fans and photographers who all want to take your picture. It’s one big party to finally celebrate the culmination of months, sometimes years, of hard work. However, what you don’t normally get on the red carpet at film premieres is the star of the film leading fellow cast mates, crew, friends – and family – in a performance of the haka – the traditional ceremonial ‘dance’ in Māori culture. But that’s exactly what Jason Momoa did at the premiere of Aquaman, which was held in Los Angeles yesterday (December 12). Since cementing himself as a bona fide star in his short-lived but unforgettable role as Khal Drogo in Game of Thrones, Momoa has won the hearts of fans across the world, thanks to his impressive stature and irresistible demeanour – everyone just wants to be best mates with the guy, right? 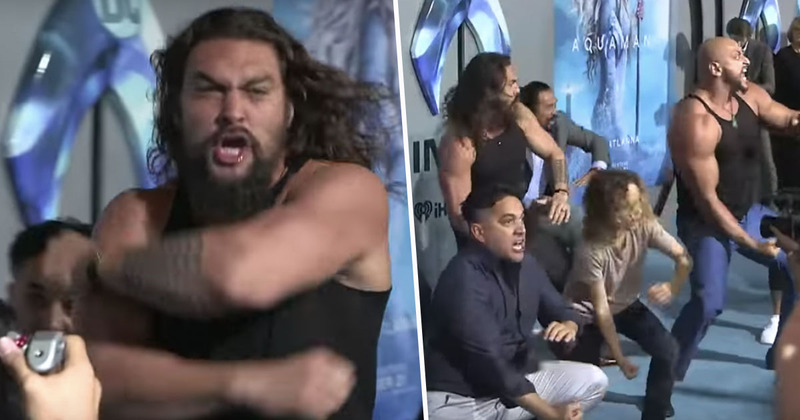 Seeing him lead the haka on the red carpet with his two kids, New Zealand’s Temuera Morrison – who plays Aquaman’s father – and a host of others, as well as breaking his golden trident over his knee in the process, was a fantastic display of celebrating culture. As you probably know, Jason is Hawaiian, and while the Haka originated in New Zealand, it has made a home in Hawaiian culture in recent years, with their own version being called the Hawaiian ha’a. Inspired by the New Zealand haka, the Hawaiian ha’a ties in native legends and movements from the hula, according to The Culture Trip. The actor has also spoken about his love of New Zealand, as well as often wearing a Pounamu necklace – a type of green gemstone found in New Zealand. Aquaman slides into cinemas this weekend, though it’s already made a splash in China, where it took a record-breaking $25 million at the box office on its opening day. Initial reviews of the film have been overwhelmingly positive, with many critics saying the new superhero film is the best DC comicbook movie since The Dark Knight. The general consensus is the film is bigger and more out there, than any DCEU movie before it, and how director James Wan has created an amazing underwater world. The film sees Arthur Curry (Jason Momoa) set out on a brand new adventure to discover both his heritage and a special trident, which will give whoever wields it the power to control the Seven Seas. Amber Heard plays Hera, Arthur’s wife, while Willem Dafoe, Dolph Lundgren and Yahya Abdul-Mateen II all join the cast. While we all sit patiently to see Jason star in Aquaman, we can bide our time with his reprisal of Khal Drogo, during his appearance on SNL. Momoa brought back his iconic Game of Thrones character one last time, though it seems Drogo’s had a career change in the afterlife. He now has his own talk show on the ‘Dothraki Public Access channel’ where he talks to other Thrones‘ characters who’ve met a grisly end. Check it out here. Aquaman is set for release in the UK December 14.